The seventh film of the DCEU (DC Extended Universe) hits the screen with the least known character so far: Shazam. It is ironic too, as Shazam lands just a month after Captain Marvel, which was her first appearance on the big screen. The DC character of Shazam was actually originally known as Captain Marvel back in his early days. But that's a story for another day. This is the most family-friendly DC movie in the franchise, and that is certainly how the film has been marketed. However, the movie does feature quite a few scary moments involving monsters and there is some moderate violence in the film. There is no blood seen on screen, but for very young children, this film isn't really suited. It is rated M after all. However, kids around 8 and up will quite enjoy it. The DCEU has been a roller coaster ride since 2013. It opened with Man of Steel (2013) to a major controversy as director Zack Snyder presented people with a fresh take on Superman, updating the character and adding real obstacles for the boy in blue. However, the film was not well received by critics and many fans, with many failing to accept the new and fresh Superman. As a result, it didn't quite hit the heights at the box office that Warner Bros wanted. Since then however, the film has gained a lot more popularity, as many have re-watched the film and started to realise that it is a masterpiece of comic book movie making. If Man of Steel's dark and gritty take on Superman caused uproar on the internet and with critics, its sequel Batman v Superman: Dawn of Justice (2016) completely sent many to war, with comment sections and forums across the internet still to this day and epic battleground of verbal tribal warfare. The extremely dark movie dealt with an off the rails, ageing Batman, who out of fear, anger and the wear and tear of twenty years fighting criminals, takes on Superman, whom he mistakes as a future threat to the world. With Batman essentially the villain for much of the movie, and the brutal fight sequences, the response was catastrophic for Warner Brothers, who by this stage, despite signing up to what director Zack Snyder had pitched to them, had now decided they wanted what Marvel had, and wanted a cinematic universe that could rake in the money. The response to this huge film that cost $200 million, caused them to panic and hastily re-write and re-edit Suicide Squad (2016) which followed BvS, and then the just going into production Justice League (2017). Both Suicide Squad and Justice League, became shadows of what the directors had intended. Only Wonder Woman (2017), which was released in between Suicide Squad and Justice League, managed to avoid much of this madness, landing in cinemas in mostly the way intended by director Patty Jenkins and as a result, despite a rewritten final act (which is the weakest aspect of the film) the film did very well both critically and commercially. However, six months later, Justice League arrived in cinemas and bombed at the box office, as the film was a total disaster in how it had been rewritten, re-shot and tonally butchered by the panicked studio. Last year, the DCEU brought Aquaman (2018) to the big screen in what turned out to be the biggest success of the series, smashing the one billion dollar mark at the box office, relieving much of the pressure on the franchise. The success of Aquaman and Wonder Woman helped keep Shazam away from studio interference. The character is always lighter than the other DC characters, as at the heart of the character, is a teenager who effectively turns into a Superman character. The success of Aquaman, and the removal of many of the executives at Warner Brothers responsible for the Justice League debacle, has seen a shift back to letting directors make the movie they wish to make, rather than trying to chase after the Marvel formula. This can only be a good thing for DC. Whilst many will say that the DCEU is finally getting on track and being successful, the truth is that the best two films of the series are still Zack Snyder's Man of Steel and Batman v Superman, films that dealt with real consequences for the actions of characters, and pushed the characters to the limits. But that's not to say that each movie has to do that. And Shazam certainly doesn't. Personally, I don't know if I can accept this film really takes place in the DCEU. There aren't really any great connections to the previous films, except for some occasional Easter-Eggs, such as newspaper headlines, and of course, the characters discussing Superman, Batman and Aquaman. This movie could be set in any DC universe. The style of the movie doesn't really allow it to feel like this is the same world in which Superman fought General Zod in a building levelling battle in Metropolis, or where an off the rails Batman had Superman under his steel boot, ready to stab him in the face with a Kryptonite spear. It does, however, revolve around family, and that is a big DCEU trope. Shazam is an odd movie, in that it swings wildly in tone from comedic and immature, to serious, dark and violent, and then completely back again, almost from one frame to the next. The film opens in an unexpected way and features a well-detailed origin story of the villain, Dr Sivana (Mark Strong), before introducing our young hero Billy Batson (Asher Angel). It is quite sometime before we eventually get Shazam (Zachary Levi). Billy is a runaway foster kid who is in search of his birth mother, from whom he was separated at a carnival as a young child. Billy is a troublemaker, and doesn't want to be pretending to be part of some fake family, and so he constantly runs away from those who take him in. 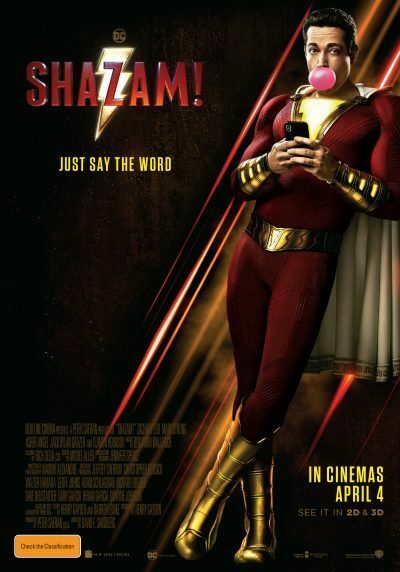 After meeting his new 'brother' Freddie (Jack Dylan Grazer), Billy gets into a fight with some bullies and runs away, only to be whisked off to another realm by the wizard Shazam and Billy is given the power to become the Wizard's champion, anytime he says the name Shazam. This turns 14 year old Billy into a fully grown man (child), who wears a very bright red and gold costume with a white cape. Shazam has many of the powers that Superman has, but also has some magical powers as well. Unsure what to do, Billy turns to Freddie and the two set off in a series of comical scenes in which they test out what powers Billy has. However, Dr Sivana has gained his own powers, these being dark powers, using the Seven Deadly Sins, a collection of gargoyle looking shadow demons who live inside the doctor and are the source of his power. They do come out from time to time however, and this is where the younger children might want to look away. As I said, the DCEU has always been about family, and it remains so here. Man of Steel was very much about Superman's fathers (both Jor-El and Johnathan Kent). Batman v Superman was very much about their mothers, including the pivotal scene known as the Martha scene. Suicide Squad, Wonder Woman and Aquaman all dealt with family as major plot points. Shazam too is very much about family, with Billy searching for his mother, but also discovering this other family along the way. The film has a great diverse cast, but it makes no mention of this, and allows diversity to exist without using it as a marketing ploy, much the same way Wonder Woman didn't use the 'female superhero' tag to market the film. Shazam features plenty of good elements. The middle section of the film is the strongest, or at least the most entertaining, as Shazam works his way through learning his powers, and confronts Dr Sivana for the first time. The effects are solid, (the budget was lower for Shazam than other DC films and so the CGI is good, but not the best you'll ever see). The Seven Deadly Sins looked like monsters out of Ghostbusters (1984) which was pretty cool for most of it, although they had no personality of their own, and considering each one represents a sin, it would have been nice to make them all a little more individual. Billy's foster family storyline works well and the characters interact with each other in a fairly realistic way. The cast is fantastic, with Zachary Levi giving a great performance as Shazam, a grown man who is really just a 14 year old. Levi doesn't come off as a grown man trying to seem like a kid inside, but instead, really feels like a giant man child. Mark Strong is a very good villain, returning to DC after his initial role in the mega-flop Green Lantern (2011). Strong has fun with the role, and he gives Dr. Sivana the right amount of menace to be interesting, but not over the top. The younger cast give great performances. Jack Dylan Grazer, best known for IT (2017), is great as Freddie, and his enthusiasm for Billy's new found powers helps push the plot along, and whilst his story arc is a little fractured at times with all else going on in the film, he has a great presence within the story. The adult characters aren't played as stupid, or just mean all the time, which is often not how adults are portrayed in this type of movie. Overall, the film is quite simple in its story. The third act didn't really hit the high notes for me, and the constant change in tone was jarring at times. It's entertaining as a film, but it's not a film that really sits up as a major entry into the DCEU, rather, just an entertaining one that can be part of your collection, but not one you'd re-watch time and time again. I rank it above Suicide Squad and Justice League, but below Wonder Woman and Aquaman. A really detailed review, thanks.